We are delighted to have ended 2009 by receiving a significant donation, CAN$125,000, from a private individual in Canada. Wow! 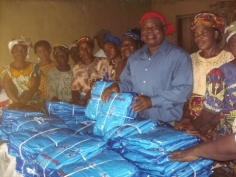 This donation will buy more than 25,000 long-lasting insecticidal nets. We are ecstatic at how many children and others this will protect. We have been told the donation was influenced by the great impact nets have per $ spent and the transparency of what we do, as reported recently by the GiveWell website. Every donation, no matter how large or small matters because every net matters. 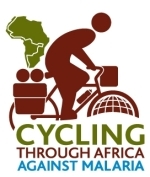 We hope to contribute even more towards reducing malaria in 2010. On August 16th 2009 Peter Gostelow began a solo and unsupported expedition, by bicycle, from the UK to Cape Town. His target is to raise £1 for every kilometre cycled (roughly 25,000 in total!). Peter is keeping a fantastic blog at http://www.thebigafricacycle.com/ detailing his journey with wonderful pictures and observations of the regions he is cycling through. Peter is currently in Portugal and as part of his journey he is raising awareness of malaria as he goes by doing some public speaking. This week he when to the American International School in Lisbon and had a great response. While malaria is a serious problem, fundraising events can be a lot of fun. A Fancy Dress Swim Against Malaria had participants making a splash in style as a part of the Santa Monica 4th of July celebrations this year. One of several Fancy Dress Swims organised by the group from Santa Monica, the well dressed swimmers have raised funds for over 600 bed nets this year. The unusual spectacle of sequins in the sea raises both funds and awareness, and looks like great fun too! Next time you're thinking of having a party, maybe a Fancy Dress Against Malaria could be your theme. Though taking a dive into the ocean could be optional. It's exciting to see the creative ways that people approach fundraising. Dawn from Dauphin, Manitoba, Canada is quilting against malaria, as part of the United Nations Exhibit Quilt Challenge. When searching for an image for her quilt under the "Making a Healthier World for our Children" theme, Dawn was inspired by the happy smiling face of a Malawian girl receiving her bed net. An experienced quilter of more than 20 years, Dawn is sharing the making of her quilt on her Against Malaria sponsorship page. And if you'd like to see the completed quilts, they'll be on display in at the United Nations in Geneva, Switzerland this November, followed by a tour of the United States at various quilt shows. Or just click on Dawn’s page to see the most recent update on her "Quilt Against Malaria". On 8 September 2009, PwC UK Board members, their PAs and other carefully selected thrill-seekers/mad people will be taking the plunge for AMF in a sponsored abseil at their Embankment Place headquarters in central London. This is just one of the many events that PwC have held in recent years in support of AMF and a group of 8 staff will be going out to Senegal in mid-August 2009 to work with local PwC Senegal staff and Peace Corps Volunteers on a distribution of some of the bednets bought with the $430,000 raised by PwC to date. If you're around Embankment on 8 September, come and see the guys in action. We have just added a great new video documenting a recent net distribution in Peru. The Peruvian Amazon basin is a high risk malaria area and more than half of the reported 64,000 malaria cases in Peru in 2007 occurred in this region. The villages were quite remote and reaching them involved boats and helicopters, as you will see in the video. Special thanks go to Patrick Kirk who edited this for us. We have had a very positive review from GiveWell, an independent charity evaluator. They have evaluated 500 charities and only recommend 6. We are one of them and we are chuffed at this recognition. Thank you for helping us reach 1 million nets which, once they are all delivered, will mean 2 million (mainly) children protected. We hope to achieve the next million nets even faster. One of our major promises is that we can guarantee that all of the money anyone raises with us will be spent buying bednets at the world's lowest price. We often get asked how we can make this promise. The answer is that our operating costs are very low and these are covered by some private donations, so we don't have to take a percentage off donations to cover administration. While we only have two people who effectively work full-time for the organisation we have many people and organisations who work with us - but they give their time and services for free. These include lawyers, accountants, printers, bankers, advertising agencies, film makers, professional translators, web technologists and graphic designers (a full list of people to thank is here). One of the questions we often get asked is why the focus on bednets and also the claim that you can link provision of bednets to lives saved. It is true, bednets are not the only weapon available in the fight against malaria. Education is important as are initiatives to remove pools of stagnant water. Drugs also have a role as does (more controversially) spraying of insecticide. However, the evidence shows that providing long-lasing insecticidal bednets is probably the single most important and effective thing that can be done. The reason for this is as follows. The malaria-carrying mosquitoes are typically the female Anopheles mosquito that bites between 10pm and 2am when seeking a blood-meal from a human. Hence nets work as they protect over the specific time when the relevant mosquitoes are biting. Of course someone could get up in the middle of the night and potentially be exposed but as you can imagine, protection while sleeping reduces hugely the chances of being bitten. Where possible, a 'blanket' coverage of all sleeping spaces in a village or community is carried out as this effectively wipes out -or close to it - a mosquito population as the mosquitoes are literally starved of a blood-meal, as well as the mass 'killing effect' insecticidal nets have when the mosquitoes land on them. Where it is not possible to achieve a complete coverage of all sleeping space, those most vulnerable, pregnant women and children under five years old, are given priority. An example might help. In a recent distribution in Uganda, the clinic covering 9 villages reported 257 cases of malaria, and three deaths, in a one month period shortly before a net distribution. In the one month period, two months after the distribution, the number of cases of malaria was seven and no deaths. A fundamental, dramatic impact. As already mentioned, malaria education is an important element in a bednet distribution which is why it is a condition of all of our distributions that they must have a malaria education component. This typically involves explaining how malaria is transmitted, proper use and care of the net, a bednet hanging demonstration and how to identify the signs of someone suffering from malaria. This helps people understand why sleeping under a net at night can protect from malaria-carrying mosquitoes. A simple play or 'skit', performed in front of the village, is often part of getting the message across. Adopting a light-hearted storytelling approach to explaining how nets protect people and kill mosquitoes is highly effective. It is explained that nets are for their use and, with comments from the village chiefs and community leaders about how these nets must be used properly, proper use of the nets is encouraged. We also use the education component of bednet distribution to talk about the importance of removing areas of stagnant water, thus also addressing this issue. Prevention is better than treatment but malaria can be treated if caught early and drugs are administered. Helping people recognise the signs of malaria, explaining that treatment is possible and encouraging them to take someone suspected of malaria to a clinic are all important education elements. However, drugs are not always available through lack of funds in a country and the very poor often have no money to pay for them. If we were to use the funds we raise for nets and drugs and all sorts of other things the message about defeating malaria would be a more complicated one to get across. As it is, we are able to focus on the simple message that 100 per cent of the money buys nets, they end up over heads and beds and we demonstrate that has happened. Other organisations focus on things such as drugs and the logistics of distributing them. This illustrates how many groups, with their own clear objectives, communicating well and acting as a large team, can defeat malaria.